Rosie's Christmas Roamings - I'm your PA : The virtual assistant company that likes to make you smile. 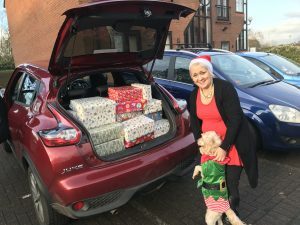 Rosie had a really exciting run up to Christmas as she was involved in the Olive Circle Foundation “Give A Gift At Christmas” campaign. Many of you know we don’t tend to do Christmas presents and cards from work, instead we donate to the Olive Circle Foundation who make up parcels for old people in homes who get no visitors or have no family. When this first started, Marie and the team provided around 200 parcels, last year it was over 400 parcels and in 2017 it was 873 parcels!! Each parcel contains toiletries, activity items, some nice edible goodies, a cracker and a card from all at The Olive Circle Foundation. 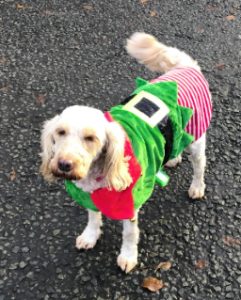 Rosie joined her Mum on the tour round the nursing homes as Santa’s Helper, she came into the homes and went around all the residents, to say she was loved is an understatement! Loads of patting and stroking, lots of happy people as she went from one to the next, tail wagging ten to the dozen! So, what has Rosie got planned for this year? The first of her two walking holidays has been scheduled for May, she will be making appearances at a number of networking events to meet her growing fan base and of course she will also be keeping the ladies at I’m Your P.A. in order! For Christmas, apart from loads of treats (all edible), Rosie now has a lovely pink jumper for the days when it is a bit cooler, so she too can be on brand. There is always a warm welcome to our visitors at I’m Your P.A. and Rosie would love to see you in 2018 – so don’t be a stranger, pop in and say hello! Oh and if you happen to have a dog treat with you, Rosie will be your friend for life.